Real estate agents always encourage clients to declutter their homes when selling them. This is because rooms look much bigger if they have less in them. Keep this in mind when you are looking at house plans on building company websites or in brochures. As it will affect how big the rooms appear to be. In this brief article, we would like to share a few tips with you about house size, and building costs per square metre so that you don’t get fooled before your building project even starts. If you are trying to get a real sense of the size of a home from a plan, look at the furniture shown on the house plan. And ask yourself whether it is the right amount of furniture that you would expect to see in that type of room. Also think about whether the furniture is the correct size for what you would need. For example, is the bed in each bedroom a single, double or queen? It can be easy for building companies to put a very small bed in a bedroom so you think you are getting a decent bedroom. But actually it is little more than a cupboard! At Fraemohs Homes we include good-sized bedrooms in our home designs and always show queen beds on the plans and brochures so you can see how big the rooms are. The same applies when visiting showhomes. One of our sales team visited a showhome in Australia a few years ago and noticed that the bed in one room was so short that her feet would have hung over the end (and she is not tall!). It did make the bedroom look much bigger than it was, but it was very deceptive. At Fraemohs Homes, we don’t think this approach is at all ethical and we always choose to put real sized furniture on our plans and in our showhomes. Above is the Greenwood Classic home, with plaster and Shadowclad cladding, a hip and gable roof style. 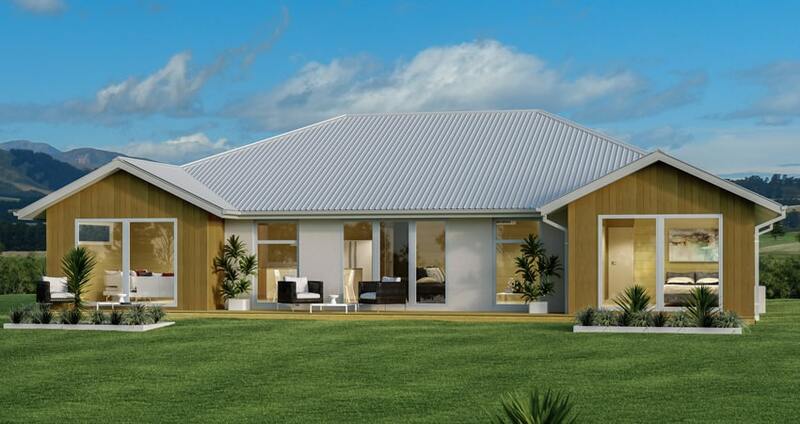 The cost to build this home on TC1 land in the greater Christchurch area would be $354,484. This house is 199m2 with 4 bedrooms and two bathrooms. And above is the same plan but with a hip roof (no gables) and the cladding for this home is brick veneer. The build price for this home on TC1 land in the greater Christchurch area would be $343,808. If you use the standard way of measuring floor area (which is to measure to the outside of the cladding), then you would say that this home is 207.25 m2. On the surface then it seems as if this home has a larger floor area but is cheaper to build! However, the actual usable space in the home is 199m2 – exactly the same as the previous version. The increase in house size is because of additional area taken up by the brick cladding, compared to the plaster and Shadowclad exterior. So, as well as dramatically changing the look of your home, different claddings and roof styles can also change the floor area of your home. And affect both the building cost per square metre and total cost. But not always in the way you may think! At Fraemohs Homes we measure the size of the home to the outside of the framing. This means if you are building a home with brick veneer you actually get more usable floor area than you would when building with other companies which include the cladding in the size of the home. Hopefully you now have a better understanding of how to determine the real size of a home by asking the right questions. If you want to build a house to fit your budget, also check out our blogs explaining the relevance of cladding and different roof styles. Have you read our guides to building a new home? They’re a great starting point and provide quality answers to real questions. Why not have a look at the Architectural Homes Guide, the Kitset Homes Guide or the House Plans Guide?